My name is Kenshi MUTO. "武藤 健志" in Japanese. If you'd like to contact me, please send a mail to <kmuto at debian.org> or <kmuto at kmuto.jp>. My public GnuPG key for signing is here. Please see my announcement of the key-transition. My previous public GnuPG key is here. This key will continue to valid for some time. September 1998- :Top Studio Corporation, desktop publishing firm. If you're interested in our company and our jobs, please don't hesitate contact us. Here is our business result. Built semi-automatic professional DTP system with Re:VIEW. May 23, 1999 - : Debian Project official developer. had attended Debconf 4 at Brazil, Debconf 5 at Finland, Debconf 6 at Mexico, and Debconf 9 at Spain. cupsys (retired), docdiff, im-switch (retired), language-env (retired), and mlterm (maintaier). Sometimes I make useful packages just for myself. Check my blog. debian-installer team: Japanese translation/committer, internationalization for CJK, testing, quality assurance. Backported d-i images archive is one of my famous job. Debian WWW team: Japanese translation committer. See status. Debian-i18n team: Japanese translation. See status. February 22, 1999 - : Debian JP Project official developer. -2009: Japanese Linux Webmasters (日本のLinux情報). I've written or audited many books and articles about Linux, Opensource, Java, network systems, and life hackings. See publishing page (in Japanese). Making a meal is the main part in my life. I enjoy it. Born in Chiba, Japan. Chiba is near Tokyo. My parents named me KENSHI. KEN (健) means 'health'. SHI (志) means 'ambition'. My first contact with computer was when I was at 7 age. I saw a game computer at a toy-shop. Some monthes later, I met a kind of personal computer at my friend's room. When I became 8 age, my father gave me 'PASOPIA-7' (made by Toshiba. It had 8-bit Z-80 CPU, 256KB memories, 8-channel PSG, and analog tape reader/recorder). I played and played it everyday like a monkey. I had learned BASIC language and a little of Z-80 assemble language. When I became 13 age, my father gave me a gift again. That was 'X68000' (made by Sharp. It had 16-bit MC68000 10MHz, 1MB memories, and dual 2HD-FD). I had learned C language, GUI operation, computer graphics, and so on. I made personal CG movies using DoGA system. I was matriculated in Chiba University, then graduated from Tutiya Lab, Department of Cognitive and Information Science, Faculty of Letters. My major was handling the electric texts with SGML (Standard Generalized Markup Language). I had learned Internet literacy and system/network administration techniques of SunOS, Solaris, NextStep, Linux, MS-DOS, Windows 3.1/95, MacOS, and PC-9801 at the lab. I bought first IBM-compatible PC (It had Pentium, 90MHz, 16MB memories) during I was undergraduate. I had learned Windows 95 and Visual Basic. I installed and had used Slackware Linux for a long time also. After graduation, I had worked at Three-A Systems as a programmer was developing document processing applications. I had worked as an network administrator also. One day, I saw Yoichi Yanagihara's article about Debian of "UNIX USER" magazine. I installed Debian 'rex' and became a fan of Debian immediately. 3 years later since I entered Three-A Systems, I decided to change a job by my personal reason. My next (and current) workplace is Top Studio Corporation, a company was founded by spin-out members from Three-A Systems. 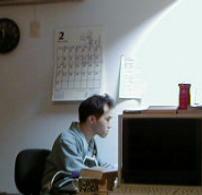 In 1999, I officially attended Debian JP Project and Debian Project.